For a problem that I'm currently working on, I found myself having to visualize some antenna patterns using MATLAB. 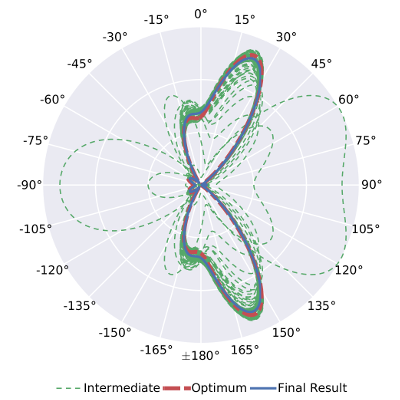 To create polar coordinate plots, MATLAB offers the polar method, which is unfortunately quite limited in functionality. For this reason, Duane Hanselman created mmpolar, which brings MATLAB's extensive handle graphics capabilities to polar plots. I wanted to create some antenna pattern plots with a light grey background and white grid lines, a color theme which is heavily inspired by Stanford's seaborn library for python/matplotlib. One problem that I faced was that mmpolar by default sets the color of the axis tick labels to the color of the axis grid lines. This meant that whenever I set the grid lines to be white, my tick labels would disappear in the white figure background, which was obviously quite undesirable. I wrote a small patch to fix this problem: It adds a TickLabelColor property to each axis, which can be different from the GridColor property, which controls the grid line color. Specifically, to set the color of the angle axis, I can now set the TTickLabelColor property and to set the color of the amplitude axis, I can set the RTickLabelColor property. Much better. After that, make sure to put mmpolar.m in a directory that is listed in MATLAB's path variable. I hope this can be useful for someone!